Only three days before Christmas! Here are a couple of reading suggestions, each featuring three (wise?) men. A boy is learning his father's craft, recognising the trees that release valuable resin and gathering the round drops, which look almost like pearls. Or tears. Today is a proud turning point for the boy. They have found a 'tear' of unusual size, big enough to fill his two hands. And in the marketplace, three strangers have their own surprising reason for wishing to buy the day's harvest. 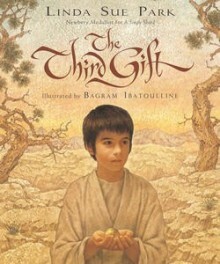 Illustrated by Bagram Ibatoulline with exquisite paintings, this book brings new resonance to the well-known gift list of gold, frankincense, and myrrh.